This preprogrammed cartridge plugs into the console of the Fairchild Video Entertainment System for 52 variations of our TV Maze games. Regular Maze: Every mouse for himself. Cat & Mouse: Mice vs. hungry cat. Paranoia: Nobody out till the cat has lunch. Or Double Paranoia: Nobody out. Ever. Maze: (2 players) Every maze is different. First mouse out wins. Jailbreak: (2 players) Escapist entertainment for the con artist. Find the weak bars and you're out! Blind-man's-bluff: (2 players) Love is blind, and so are the mice! Trailblazer: (2 players) Can't see the forest for the trees. Lose your opponent by leaving a false trail. Before you begin, there are a few things you ought to know. Each maze is randomly generated by the computer and no two mazes will be alike. There is always a beginning and an end to each maze. There are two mice, each with a distinctly different squeek. The left player's mouse is red and has a high-pitched squeek. The right player's mouse is blue and has a low-pitched squeek. Your mouse will squeek when it hits a wall. 1. The maze type: Maze, Jailbreak, Blind-Man's Bluff, or Trailblazer. 2. The mode of play: The speed of the players and whether a third computer generated object ("the cat") is present. Two players race each other out of the maze. You against the computer. 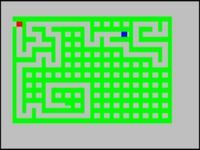 Your mouse has to puzzle his way out of the maze before the other mouse does, and at the same time has to outwit the cat. The cat is controlled by the computer. The cat starts his journey through the maze at the end on the right. The mice start at the beginning on the left. The cat sniffs his way through the maze looking for mice. If the cat meets your mouse, look out! You mouse will be eaten by the cat in a blaze of ravenous hunger, and you will be out of the game! The ruthless way to play 'Cat and Mouse.' Not only does your mouse have to worry about beating the other mouse and avoiding confrontations with the cat, neither mouse can leave the maze UNTIL ONE MOUSE HAS BEEN EATEN BY THE CAT! "Double your anxiety while on the run, let NO mouse out, instead of just one!" Since the Paranoia option means that before any mouse can leave the maze the other must be eaten by the cat, and you have no cat, that means that nobody can EVER leave the maze. You're stuck in it! or reason you can think of!